Due to technological advancements infertility has not remain hindrance for conception. It is possible for even the infertile couple to get their own baby. IVF is also one such advancement of science that has blessed many hopeless couples. It is the lab procedure in which females eggs are mixed with the male sperms outside the body under controlled conditions that mimic the womb of mother. This revolutionary procedure of artificial conception process leads to successful pregnancy. In-Vitro-Fertilization is the procedure must be done by the specialized and expert doctor so that successful results can be obtained after IVF cycle. Initially the IVF expert Dr. Sumita Sofat evaluate the infertility problem and give proper counseling to the couple so that they could positively make their mind for the procedure. Sperms and eggs are kept in the cultured dish for fertilization. This entire fertilization process is done under the Em-Cell closed chamber for optimized favorable conditions. 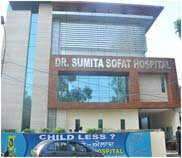 For more details about IVF procedure feel free to talk to experts of Sofat IVF Center in Faridkot.